Many believe that Arthur C. Clarke’s novel, Childhood’s End , is his best. The idea behind the title is the advancement, the maturing, of the human race upon contact with superior beings. There is an end to war, an Edenic life, and an eventual oneness with the mind of the universe, that overcomes the limits of material existence (though not without a few bumps in the road). It is interesting how close this comes to a biblical view of the future. We are told that there is a time coming where it is necessary for us to mature. This maturity will end war, will usher in a Edenic life, and will eventually bring us to a oneness with the God of the universe, overcoming the limits of our physical existence (though not without a few bumps in the road). 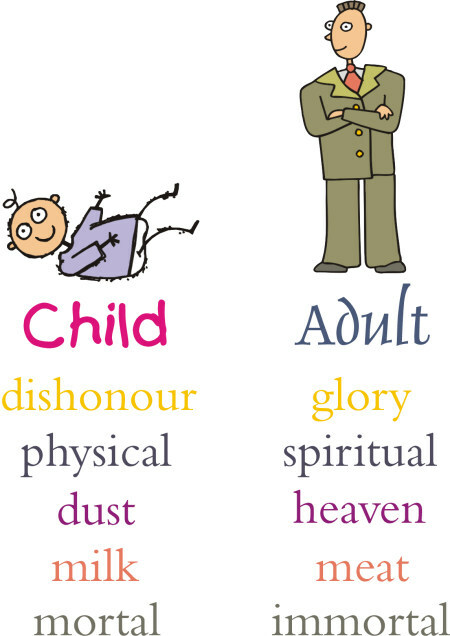 Unless you be folded and become like children, you will never enter the kingdom of heaven. One example we are given is the story of the prodigal son. The father had two sons, and only one son put on the attributes of the child. Yet, at the end of the story, it is this son who is maturing and has entered into his father’s house. The other son is having a pity party outside and missing all the fun. Adam was the child. He was all the attributes of a child – perishability, weakness, a man of dust. Jesus Christ was humanity matured. His attributes were imperishability, power, a man of heaven. This is why we are called to reach the measure of the stature of the fullness of Christ. It is through maturing that we lay aside the dim glass and see face to face. We see that which opposes this spiritual call to maturity in the world around us. Never before has youth commanded such respect. Our culture is gradually flattening, pushing prostitot fashion on infants and comic book worship upon elders. The high temple of entertainment leans ever more heavily upon youth indices to green light production. Government has become everlastingly paternal, punishing us for our indiscretions and patting our heads for our confidences. Yet most of us won’t heed this call to ascend. We are told that one of the signs of the end is that the called will fall away from their calling – they will refuse to heed the demand for maturity, instead remaining children. Bonus: This folds into our timeline, and that will be updated in the next post.